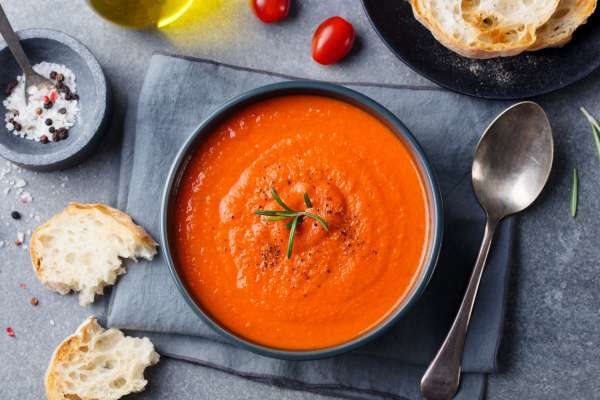 A steamy bowl of this classic soup will not only warm you up, but offers a tasty way to consume nutrients that are of benefit to your eye health. Tomatoes supply antioxidants that protect your skin and eyes. The fresh fruit can help protect eyes from light damage, too. They’re a rich source of lycopene, lutein, and beta-carotene. These powerful antioxidants have been shown to protect the eyes against light-induced damage, the development of cataracts, and age-related macular degeneration (AMD). Elizabeth Gray shares her favourite recipe. Heat a saucepan over medium heat. Put in a bit of oil. Dice the onion, and put in the pan. Crush your garlic and add to the pan. Heat for a few minutes. Add the tomatoes, 2 cups of the soup broth, and the milk. Simmer for 30 minutes. Chip the basil and add. Simmer for 5 more minutes. Transfer to a blender and mix on high. Top with salt and pepper and serve.